After the release of Skype for iPhone by Skype team , Yahoo just came out with an iPhone client for Yahoo messenger . 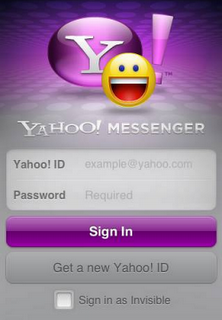 The initial release of Yahoo messenger for iPhone is getting mixed reaction from users and blogosphere . It has almost all the features of desktop version of Yahoo messenger plus some disadvantages . Yahoo messenger for iPhone didn’t created much hype as there are other iPhone applications that can open Yahoo ,Google talk and Live messenger in single window.People are already using Beejive IM ,Nimbuzz and others that can even manage VOIP over a suitable iPhone data plan . Anyway if your looking for a standalone and free Yahoo messenger application ,download Yahoo messenger for iPhone here . Download Yahoo messenger for iPhone. 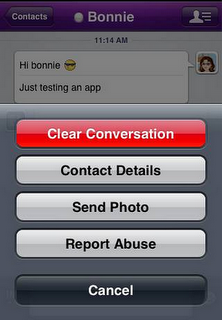 Yahoo messenger for iPhone can send and receive instant massages ,just like in desktop Yahoo messenger client . Add or remove contacts . Share photos between other Yahoo messenger buddies. 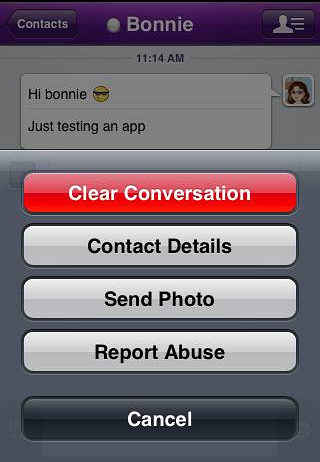 Yahoo messenger for iPhone can access the default iPhone spell check in chat window. Alerts when there is a new message . Stealth settings and status updates . Though the application supports background operations when minimized , it lasts only for 10 minutes . After 10 minutes you will need to login again . Yahoo messenger for iPhone is now available via a direct link .And would be available for search in the iPhone app store by tomorrow . Download Yahoo messenger for iPhone (Direct link ).